You’ll recall I did a giveaway for A Memory of Light the fourteenth and final novel in Robert Jordan’s Wheel of Time series recently. 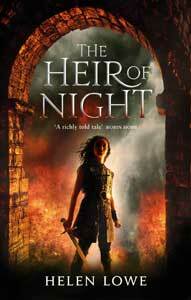 Sparked by commenters’ enthusiasm, and given the significance of this series within the epic fantasy canon, I asked long time SFF reader, Chris Whelan, if he would review the final three books in the series—all written by Brandon Sanderson in accordance with notes left by Robert Jordan. Chris is a new reviewer for “…on Anything, Really” and I’m very pleased to welcome him here today. I’ve been reading fantasy for a little over three decades now. I used to have thousands of books in my collection, but as the years have passed, I’ve whittled them down to the few hundred that still engage and interest me, and demand a periodic re-reading. Robert Jordan’s Wheel of Time series has survived the periodic cullings. I first read it when the third book came out – mistakenly thinking it was a new, complete trilogy. I re-read it when the fifth book came out, thinking: “surely that’s it – he’s finally wrapped it up.” I then held off until the eleventh book came out and I heard that Robert Jordan had passed away. Each time I re-read the series, it gave me the same pleasure as it had the first time. It was a rich world, with a complex story, told in detail, with engaging characters, action and adventure. I heard that Brandon Sanderson had been asked to finish the series and I had my doubts. How could another author bring all those story lines together and remain true to the style and spirit of the series? With the fourteenth and final book just out, I thought it was time to answer that question. 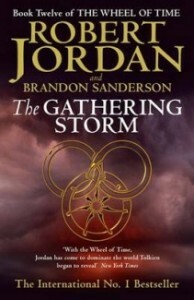 Book Twelve of the Wheel of Time series is The Gathering Storm. At nearly 900 pages, it’s a long read. The pleasing news is that it’s a good read. Brandon Sanderson captures the world of Robert Jordan well. The writing style, tone and voice feel like that of the rest of the series. It is an effortless read and I happily devoured the entire book in a weekend. As with the earlier books, all the major characters are there and chapters and sections move quickly between them. There are a lot of minor characters and keeping them all straight in the head can be a challenge. It would be great if a future edition actually included the characters in the appendix that accompanies every book. Large chunks of this book feel like they are really just getting all the characters into places or positions for the final battle. Some major characters get entire chapters or large sections of chapters where they do no more than discuss what has happened (recapping for the reader), speculate on what might happen (foreshadowing), and travel along a roadway. Still, that’s the worst I can say about the book. A large chunk of the book is focussed around Rand overcoming his own demons and preparing the rest of the known world for the Last Battle. As in each of the previous books, there is one major plotline that is at the core of the story. In this book, the focus is on the divisions in the White Tower. Without revealing anything untoward, it’s generally well done and a satisfying conclusion to a plotline that’s been playing out over the past three or four books. All in all, The Gathering Storm has earned a place on my bookshelf. Just as importantly, I’m keen to see what happens next. Chris Whelan is a long time viewer, reader and occasional writer of fantasy and science fiction. He makes a living in middle management and lives, generally, with a glass of red wine somewhere to hand.